The Mia Mia Daylight Opera is an extremely popular annual event. 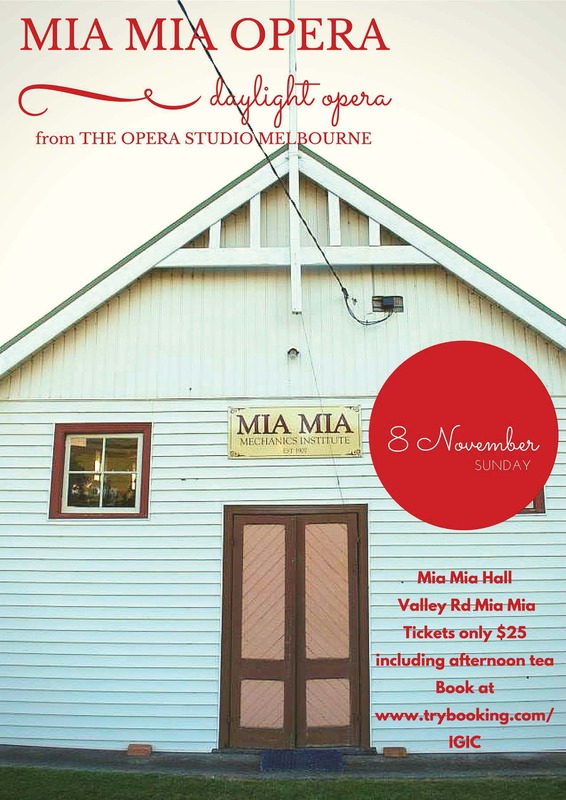 The perfect acoustics of the quaint timber lined Mia Mia Hall play host to international and rising stars from The Opera Studio Melbourne, for one weekend only, providing the local region with the opportunity to experience the drama and fun of opera in an idyllic country setting. Bookings: Bookings can be made via TryBooking. The Mia Mia Mechanics’ Institute (the Hall) Hall is the centre of the district’s community activities, and has been so since its opening in 1907. The Hall’s original cost was three hundred and four pounds, most of that was spent on labour as the community provided most of the building materials. The site for the Hall was donated by the Dwyer family. Many grand Balls, Concerts, Flower Shows, Australia Day breakfasts, Tea Meetings, Big Sings, Birthday parties, Wedding Anniversaries, Art Shows, Opera and even Badminton have been held in the Hall, many of these events are still held there today.